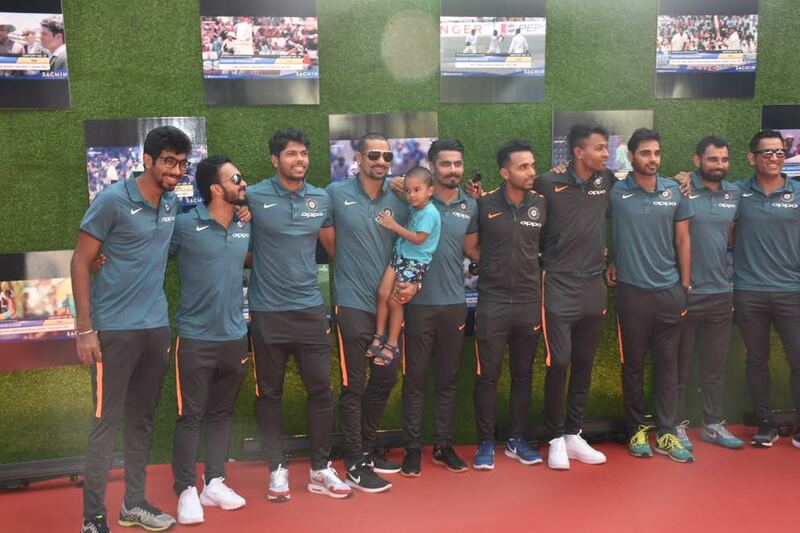 The Indian cricket team came together to watch the special screening of legendary cricketer Sachin Tendulkar’s biographical drama film ‘Sachin: A Billion Dreams’, in Mumbai on Wednesday. Cricketers like Mahendra Singh Dhoni, Virat Kohli, Yuvraj Singh, Shikhar Dhawan, Ravichandran Ashwin, Ajinkya Rahane to name a few, were present in full force at the premiere of the film. Sachin A Billion dreams bring to the silver screen one of the most inspiring stories of Sachin, the cricketing legend on celluloid. The Indian cricket team were seen in immense anticipation to experience the aura of Sachin Tendulkar on the big screen. The Men in Blue were seen cheering for the master blaster at the red carpet while exhibiting immense excitement to watch the film. Sachin A Billion Dreams will showcase Sachin on the big screen for the very first time, the film is touted to bring to the forefront the unheard story of the ace cricketer. Produced by Ravi Bhagchandka of 200 Not Out and Shrikant Bhasi of Carnival Motion Pictures, and helmed by Emmy-nominated James Erskine, ‘Sachin: A Billion Dreams’ is all set to release on 26th May 2017.